کانسار آهن تخت در فاصله 120 کیلومتری شمال ‌خاور شهر همدان و در شمال کمربند ماگمایی ارومیه- دختر قرار دارد. نفوذ توده‌ گرانودیوریتی میوسن میانی به ‌درون کربنات‎های کرتاسه سبب کانی‌سازی آهن شده است. کانی‌سازی دیرزاد پرکننده ‌فضای خالی و جانشینی به صورت رگه‌ و عدسی‌‌شکل با دگرسانی‌های آرژیلیک، کربنات، کلریت، اپیدوت، سیلیس وکانی‌های گارنت، پیروکسن، اپیدوت، ترمولیت- اکتینولیت، فلوگوپیت، هورنبلند، کوارتز، کلسیت، مگنتیت، پیریت، اسپکیولاریت، کالکوپیریت، هماتیت، لیمونیت، گوتیت و مالاکیت دیده شده است. ژئوشیمی ماده‌ معدنی گویای حضور عناصر Si, Al, Ca, Mg, Ti و نیز عناصر کالکوفیل Cu, Zn, As, Pb و به‌ دلیل همراهی کانی‌های کالک‌سیلیکاتی و کانی‌های سولفیدی با مگنتیت است. میانبارهای سیال دمای همگن‌شدگی میان 2/153 تا 3/338 درجه سانتی‌گراد و شوری از 827/0 تا 36/25 درصد وزنی نمک طعام دارند. در مرحله کانی‌سازی آمیختگی سیال‎های ماگمایی با آب‌های جوی در مرحله متاسوماتیسم پسرونده رخ داده است. مقدار δ18O کانی مگنتیت میان 46/0- تا 31/2+ ‰ و مقدار δ18Owater سیال مولد کانی‌سازی میان 1/8+ تا 9/10+ ‰ متغیر است. این مقدار مشابه با سیال‎های ماگمایی متعادل شده با منبع دارای 18O بالاست. 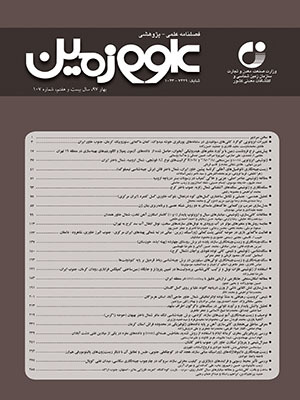 مقدار δ34S در کانی پیریت ماده‌ معدنی میان 3/7+ تا 5/12+ ‰ و مقدار δ34SH2S سیال مولد کانی‌سازی میان 7/5+ تا 9/10+ ‰ است. این مقادیر مثبت دخالت منشأ سولفات‌های تبخیری را در تأمین گوگرد نشان می‌دهد. در مرحله دگرگونی پسرونده فلزات تحرک یافته همراه با سیال‎های فلزدار حاصل از سرد شدن توده‌ نفوذی با آب‌های جوی سولفوردار مخلوط شده و در سنگ‌آهک‌های کرتاسه دارای فضای خالی ساختاری کانی‌سازی اسکارن کلسیک آهن تخت را به وجود آورده است. The Takht iron deposit is located 120 km northeast of the Hamedan City in the Urumieh-Dokhtar magmatic belt. The Miocene Takht granodiorite intruded into the Cretaceous carbonates and resulted in Fe-skarn formation. Epigenetic mineralization in the Takht Deposit occurred predominantly as vein and lenticular ore bodies accompanied with argillic, carbonation, chloritization, epidotization and silicfication alterations and minerals including garnet, pyroxene, epidote, tremolite- actinolite, phlogopite, hornblende, quartz, calcite, magnetite, pyrite, specularite, chalcopyrite, hematite, limonite, goethite and malachite. Chemical composition indicates the presence of Si, Al, Ca, Mg, Ti and chalcophile elements such as Cu, Zn, As and Pb that originate from the coexistence of silicate and sulfide minerals with magnetite. The microthermometric results revealed homogenization temperatures (Th) from 153.2°C to 338.3°C and salinity from 0.827 wt.% NaCl eq. to 25.36 wt.% NaCl eq.. The δ18O (SMOW) values of magnetite were measured in the range of −0.46‰ to +2.31‰ and δ18O water is +8.1‰ to +10.9‰, respectively. These isotope values are similar to magmatic fluids that were also equilibrated with 18O enriched sources. The δ34S (V-CDT) values of pyrite show ranges of +7.3‰ to +12.5‰ and the original ﬂuid δ34S H2S values were estimated ranging from +5.7‰ to +10.9‰. These positive δ34S values confirm that sulfur is provided by evaporate sulfates. During the retrograde stage of the Takht Skarn, re-mobilized metals accompanied with metal-bearing fluids (provided by intrusion) were mixed with sulfur-bearing descending meteoric waters and eventually, the mixing of the two fluids led to calcic Fe-skarn mineralization in Cretaceous carbonates. آقانباتی، س. ع.، 1383- زمین‌شناسی ایران، انتشارات سازمان زمین‌شناسی و اکتشافات معدنی ایران، 606 ص. رحیمی، ا.، 1395- گزارش پی جویی، اکتشاف تفصیلی و ارزیابی ذخیره کانسار سنگ آهن تخت، سازمان صنعت، معدن، تجارت استان همدان. مجیدی‎فر، م.ر. و شافعی، ع.، 1385- نقشه زمین‌شناسی 1:100000 مرزبان، انتشارات سازمان زمین‌شناسی ایران. Alavi, M., 1994- Tectonics of the Zagros orogenic belt of Iran: new data and interpretations. Tectonophysics 229: 211-238. Brown, P. E. and Lamb, W. M., 1989- P-V-T properties of ﬂuids in the system H2O±CO2±NaCl: new graphic presentations and implications for ﬂuid inclusion studies. Geochimica et Cosmochimica Acta 53: 1209-1221. Chambers, L. A., 1982- Sulfur isotope study of a modern intertidal environment, and the interpretation of ancient sulfides. Geochimica et Cosmochimica Acta 46: 721-728. Claypool, G. E., Holser, W. T., Kaplan, I. R., Sakai, H. and Zak, I., 1980- The age curves of sulfur and oxygen isotopes in marine sulfate and their mutual interpretation. Chemical Geology 28, 199-260. Deer, W. A., Howie, R. A. and Zussman, J., 1991- An Introduction to the Rock Forming Minerals. 7th impression, Longman, London. Einaudi, M. T., Meinert, L. D. and Newberry, R. J., 1981- Skarn deposits. Economic Geology. 75th Anniv: 317-391. Faure, G. and Mensing, A., 2005- Principles of isotope geology. 2th edition, Johm Weily and Sons, New York, chapter 25,460. Faure, G., 1986- Principle of isotope geology. John wiley, Inc, New York, 589 pp. Gehlen, K. V., Nielsen, H., Chunnett, I. and Rozendaal, A., 1983- Sulphur isotope in metamorphosed Percambrian Fe-Pb-Zn-Cu sulphides and barite at Aggeneys and Gamsberg, South Africa. Ineralogical Magazine 47: 481- 486. Ghasemi, A. and Talbot, C. J., 2006- A new scenario for the Sanandaj–Sirjan zone (Iran). Journal of Asian Earth Sciences 26, 683-693. Hass, J. I., 1971- The effect of salinity on the maximum thermal gradient of a hydrothermal system at hydrostatic pressure. Economic Geology 66: 940-946. Hoefs, J., 2004- Stable isotope geochemistry. Springer Verlag, Berlin, 244 pp. Kamei, G. and Ohmoto, H., 2000- The kinetics of reactions between pyrite and O2-bearing water revealed from in situ measurements of DO, Eh and pH in a closed system. Geochimica et Cosmochimica Acta 64: 2585-2601. Kesler, S. E., 2005- Ore-forming fluids. Elements 1, 13-18. Kohn, M. J. and Valley, J. W., 1998- Oxygen isotope geochemistry of amphiboles: isotope effects of cationsubstitutions in minerals. Geochimica et Cosmochimica Acta 62: 1947-1958. Kwak, T. A. P. and Tan, T. H., 1981- The geochemistry of zoninig in the skarn mineral at the at the King Island_Dolphine mine. Economic Geology 76: 468-497. Marschik, R., Spikings, R. and Kuscu, I., 2008- Geochronology and stable isotope signature of alteration related to hydrothermal magnetite ores in Central Anatolia, Turkey. Mineralium Deposita, 43(1): 111- 124. Meinert, L. D., 1984- Mineralogy and petrology of iron skarns in western British Columbia, Economic Geology 79: 869-882. Meinert, L. D., 1992- Skarns and skarn deposits. Geoscience Canada 19: 145-162. Mucke, A. and Cabral, A. R., 2005- Redox and nonredox reactions of magnetite and hematite in Rocks. Chemie der Erde 65: 271-278. Nabatian, G., Rastad, E., Neubauer, F., Honarmand, M. and Ghaderi, M., 2015- Iron and Fe-Mn mineralisation in Iran: implications for Tethyan metallogeny. Australian Journal of Earth Sciences 62: 211-241. Nadoll, P., Angerer, T., Mauk, J. L., French, D. and Walshe J., 2014- The Chemistry of hydrothermal magnetite A review. Ore Geology Reviews: 1-70. Ohmoto, H. and Goldhaber, M. B., 1997- Sulfur and carbon isotopes. In: Barnes, H.L. (Ed. ), Geochemistry of hydrothermal ore deposits. 3rd edition, John Wiley and Sons, New York, pp. 517-611. Ohmoto, H. and Rye, R.O., 1979- Isotopes of sulfur and carbon, in: Barnes, H.L., (Ed), Geochemistry of Hydrothermal Ore Deposits (II). John Wiley and Sons, New York, pp. 509-567. Ohmoto, H., 1972- Systematics of sulfur and carbon isotopes in hydrothermal ore deposits. Economic Geology 67: 551-577. Ohmoto, H., 2003- Nonredox transformations of magnetite-hematite in hydrothermal systems. Economic Geology 98: 157-161. Roedder, E., 1984- Fluid inclusions. Mineralogical Society of America, Reviews in mineralogy 12, 644 pp. Sharp, Z., 2006- Principles of stable isotope geochemistry, chapter 10: 409. Shepherd, T. J., Rankin, A. H. and Alderton, D. H. M., 1985- A practical guide to fluid inclusion studies. Blackie, London, 239 pp. Sheppard, S. M. F. and Epstein, S., 1970- D/H and 18O/16O ratios of minerals of possible mantle or lower crustal origin. Earth and Planetary Science Letters 9(3): 232- 239. Sun, H., Wu, J., Yu, P. and Li, J., 1998- Geology, geochemistry and sulfur isotope composition of the Late Proterozoic Jingtieshan (Superiortype) hematite-jasper-barite iron ores deposits associated with stratabound Cu mineralization in the Gansu Province, China. Mineralium Deposita 34(1): 102- 112. Taylor, H. P., 1997- Oxygen and hydrogen isotope relationships in hydrothermal mineral deposits, In: Barnes, H.L. (Ed. ), Geochemistry of hydrothermal ore deposits. 3rd edition, John Wiley and Sons, New York, pp. 229-302. Wen, G., Bi, S. J. and Li, J. W., 2017- Role of evaporitic sulfates in iron skarn mineralization: a fluid inclusion and sulfur isotope study from the Xishimen deposit, Handan-Xingtai district, North China Craton. Mineralium Deposita 52: 495-514. Wilkinson, J. J., 2001- Fluid inclusions in hydrothermal ore deposits. Lithos 55: 229-272. Xiao-Wen, H., Liang, Q. I. and Yumiao, M., 2014- Trace element geochemistry of magnetite from the Fe(-Cu) deposits in the Hami region, eastern Tianshan orogenic belt, NW China. Acta Geologica Sinica 88: 176-195. Zheng Y. F. and Simon, K., 1991- Oxygen isotope fractionation in hematite and magnetite: A theoretical calculation and application to geothermometry of metamorphic iron-formation. European Journal of Mineralogy 3: 877-886.